USB 2.0 Printer Auto Sharing Switch enables two PCs and/ or Macs to easily share one USB device such as a printer, scanner, or hard drive. No more plugging and unplugging between your computers. You can easily request print job on screen. No need to change cable or turn switch on the switch box. You can switch on screen. This USB hub gives you seven more USB 2.0 ports! It's backwards compatible with USB 1.1 specifications and includes an AC/DC adapter for providing additional power for charging USB devices. 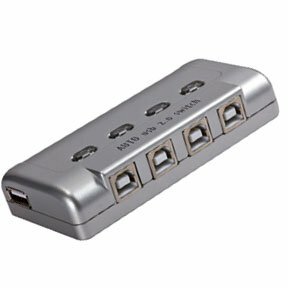 Add more peripherals or charge your mobile devices with this 7-port USB 2.0 hub! Get yours today! Printer Switches allow your printer to be connected via USB. These printer switches are extremely useful to make your day to day tasks easier. You can order them at SF Cable and get them delivered at your doorsteps. Our range of printer switches include 2 ports manual USB sharing data switch, 4 ports manual USB sharing data switch, USB 2.0 manual switch 4-PCs to 1-USB devices, 4 way USB switch USB button vertical, 4 way USB switch manual & OSD, USB 2.0 crossover 2 to 4 sharing switch, 4 port USB auto share switch, and many more products. All our products are checked for quality before they reach you and are eligible for after sales service and lifetime technical support. You also get the products at very competitive prices.